MyScience is a primary science education initiative in which being in a community of practice (CoP) is integral to the learning process. Stakeholder groups—primary teachers, primary students and scientist mentors—interact around the CoP domainof investigating scientifically and learn from each other through participation. This paper is the fifth in a series and reports 27 year 5/6 students’ (from three schools) perceptions of how their views were influenced through their involvement in a MyScience CoP. Semi-structured interviews, guided by a phenomenographic framework, were the substantive data source. Primary students’ perceptions about science, science learning and science teaching were analysed using attributes associated with both communities of practice and the nature of science. Findings reveal that students’ perceptions of what it means to be doing science’ were transformed through their participation and students were able to identify some of the contributing factors. Where appropriate, students’ views were compared with the published views of their participating scientist mentors and teachers from earlier papers. Implications for science teaching and learning in primary school community of practice settings are discussed. 1. How long have you been doing MyScience? 2. What does it mean to be ‘doing’ MyScience? 3. What have you got out of doing MyScience? 4. What’s the difference between doing MyScience compared with doing ‘normal’ science? 5. What do you think is good or important about the mentors coming in? 6. What do you think the role of the Principal is in MyScience? 7. What do you think the role of the classroom teacher is in MyScience? 8. What do you think the role of the students is in MyScience? 9. What do you think the role of the parents is in MyScience? 10. What happens in the Science Fair 1? 11. How has MyScience changed for you since you’ve been doing it? 12. Can you give me a sound bite, or in a nutshell, what is MyScience? 13. Is there anything else that you can think of that I haven’t asked you about MyScience that is interesting? Assertion (1): Participation in MyScience changed primary students’ views of what it means to be ‘doing science’ in the primary classroom: these views exemplified CoP and NOS attributes that underpin, in part, the MyScience initiative. Amelia identified that she had gained knowledge about ‘the process of the science [sic] … how to actually set it up properly, and do the experiments, and think it all through … how you set all the results up’. Three others made similar comments adding they learned: ‘…writing [up] the scientific investigation … what to do in what order and [to] make sure it’s a fair test’ (April); ‘…you have to be very exact to carry out something accurately’ (Cassius); and ‘… how to work out how to plan it… do my log and… present it in a way that people would be interested’. (Carmen). I now know [more about] photosynthesis … basically how … green light cannot go through a green plant. [We found that] the best [type of light] was actually the green, surprisingly. It was actually the same for both of them … First we thought of theories why it could have been like that … contradicting the photosynthesis … [but] nobody’s done the [sic] plant in particular. In this anecdote, she shows some understanding of how plants use light energy to grow (‘photosynthesis’), but her comments also indicate awareness of the need for replication in the inquiry process (‘both of them’), the tentative nature of science (‘surprisingly’), that science is collaborative (‘we’) and that science is developmental—building on others’ findings (‘theories … nobody’s done the plant in particular’). This is evidence of NOS 1, science is inquiry based; NOS 2, science is tentative; NOS 3, science is developmental (builds on the findings of others); and NOS 6, science is collaborative (‘we thought of theories’) all of which are aspects of ‘Science as a Human Endeavour’ (SHE) (ACARA 2016)—one of three major strands in the Australian Curriculum: Science. The notion of ‘we’ refers to students (and mentors) working and thinking together to solve issues associated with the investigation and is therefore an example of CoP 2: members who are collaboratively engaged in activities and discussion related to the domain. Chad, a fourth-timer participant, described how his own NOS expertise had developed through serial participation [NOS 3] in MyScience. His personal observations indicate awareness of increasing sophistication of how to do testing (‘became more complex’, ‘in Year 3 we did something really basic’). What is interesting here is that Ben is concerned with and relates his science skills and knowledge to real life issues. He later added: ‘To be doing MyScience [means] to be doing experiments to find out something that is worth finding out for the human society’. Ben is fulfilling the hope of three of the five school B engineer mentors (Ezra, Emily and Elana) (Forbes and Skamp 2013) who said they wanted to help students understand the link and increase the relevance between ‘school science’ and ‘real-world science’. These examples demonstrate primary students’ awareness of their increased knowledge of scientific methods, phenomena and principles while interacting with others in MyScience, that is, through their participation in MyScience, and correlate with their mentors’ and teachers’ perceptions of student learning (Forbes and Skamp 2013, 2014). Smith et al. (2000) similarly reported that student involvement in a ‘community of learners’ resulted in participants demonstrating sophisticated notions of the nature of science. In normal school science we just learn stuff, we don’t do much [sic] experiments. But in MyScience we actually get to conduct an experiment and the thrill of … we predicted that the vinegar would melt the ice cube fastest, and we were all ecstatic that [we were correct]. Here, students are linking enjoyment (‘fun’, ‘thrill’, ‘ecstatic’), learning how things work and the process of investigating scientifically with the notion of ‘being a scientist’. Some have also appeared to realize the significance of hands-on activities needing to be minds-on (e.g. Adam’s reference to ‘logics’). These students are exhibiting positive views about science, which was a goal for participating scientist and engineer mentors (see Forbes and Skamp 2013, assertion 4) and has been identified as a critical precedent for students’ behaviour, interest and engagement in science, which, when combined with successful learning experiences tends to lead to an enduring positive commitment towards science (Osborne et al. 2003). Palmer’s (2005) ‘attitude-motivation-learning’ links support the contention that students with positive attitudes are more likely to have the motivation to learn and that once engaged they experience increased agency and development of their science identities (Brown et al. 2005). If the end goal is improved/increased student learning in science, then the starting point is to provide opportunities where students develop positive attitudes towards science. When comparing MyScience with normal school science, Adam and Anne commented that they did do hands-on activities in their normal school science but these activities were not minds-on—they lacked the use of scientific practices—a notion also raised by their teacher Angela (see Forbes and Skamp 2014, assertion 1b). in normal science, even with the bean growing, we didn’t do any graphing …, just water(ed) it. [When growing plants in MyScience] we actually did graphing and we got to find the averages and record the results. So we actually got to know about (and) feel like you’re actually doing some science. …with normal science… we just have to write stuff out and … keep it in your mind but with MyScience it’s much easier to learn because you actually get to do things (and doing things helps you learn more) … because if you’re having fun, you’re more likely to remember it. Cassius contrasted the ‘recipe approach’ of normal school science with that of MyScience: ‘we just listed what would happen and what’s already known’ compared with ‘we’ve got to do what we don’t know and test it out’ indicating understanding of the purpose of ‘investigating scientifically’. These vignettes and the earlier examples show that students remember participating in hands-on activities in their ‘normal science classes’ but that through MyScience they have come to recognize that these experiences were not scientific (‘didn’t have a procedure … a lot of factors changed … no data collection …’) or interesting. The resulting disinterest, disengagement and lack of learning when students merely follow recipe style investigations (hands-on but not minds-on) are well noted (Goodrum et al. 2001). Through MyScience, students have learned that scientific inquiry has a procedure where variables are controlled (Adam), that measurements need to be taken, recorded and reported (Anne) and that science can be interesting and it is through using scientific methods (experimenting) that they are able to learn how the world works. There was also recognition by Anne that MyScience provided her with an authentic science experience (‘you actually feel like you’re actually doing some science’). This strongly suggests that students realize that science is inquiry based [NOS 1] and represents partial achievement of one of the main reasons why scientists became MyScience mentors—for students to gain ‘scientific intuition’ (Forbes and Skamp 2013). When asked what he had got out of doing MyScience, Ben was the only school B student who specifically mentioned science inquiry skills (ACARA 2016) explaining that he had ‘learned how to do experiments a lot better’ and learning that ‘this meant … how to make a test, … which ones would be worth the human society knowing about, and how to display and record results’. Overall, school B students appeared to place less emphasis on their use of, and the significance of, scientific inquiry skills than school A students. This difference between student cohorts could be due to the type of guidance provided by the mentors (astronomers at school A and engineers at school B), each with their own community of science practices and their own motivations for involvement as mentors. Scientist mentors at school A wished to develop students’ scientific intuition: ‘to seed an interest in, and a love of, science in students’ (Forbes and Skamp 2013, p. 1020), to have science viewed as being ‘inquiry based’ and to give students ‘agency’ to be able to ‘independently ask and answer questions’. Engineer mentors at school B also wanted students to develop an interest in science but their focus appeared to be aimed at helping students ‘to understand the link and increase the relevance between ‘school science’ and ‘real world science’ (Forbes and Skamp 2013, p. 1020). It could be argued that multiple interactions between students and mentors—who have particular ways of thinking, discussing and using science and who have different motivations for their involvement as mentors—results in students who then reflect their mentors’ views. Thus, school A students, who were mentored by practising astronomers, may have encountered more emphasis on the use of scientific methods and so commented more frequently on these aspects. Another possibility for the difference between the two student cohorts could be related to the number of times that they have experienced MyScience. As stated earlier, school A students were all first-timers while school B students were old-timers. MyScience has a focus on scientific inquiry, so for school A students who were new to the program, their recollected experiences may be more likely to be in this area. School B students had experienced MyScience several times so exposure to, and the more frequent use of scientific inquiry processes, dialogue and discussion may have rendered these activities to be a less memorable topic for discussion during the research interviews. School B students’ recollections of their MyScience experiences tended to focus on aspects such as content knowledge associated with their topic area, reinforcing this interpretation. Further research is needed to identify the effects of the mentors’ background and repeated experiences of MyScience on students’ reported responses. MyScience was described as a collaborative enterprise by many students: ‘…working together in a group to find out how something works’ (Alan); ‘… much better than working by yourself … working with other people can actually make the job easier’ (Adam); and you ‘can learn more from each other’ (Carla). Four of the eight school B students indicated that group work provided access to a wider variety of ideas than could be achieved individually and that these ideas could be combined: Blake stated this succinctly as ‘more people means more ideas’, while Bella referred to a sense of safety and a willingness to share and learn from others’ ideas. These comments recognized that science is collaborative [NOS 6] and that CoP members learn from each other, especially when in groups [CoP 1 and 2]. Blake and Bill exemplified additional values of collaborative investigations in MyScience: ‘We have an idea and then we can join … two people have an idea, then we combine them together … to make a big success’ (Blake). Bill described a group interaction that resulted in his group accepting and using his idea to more carefully record their data: ‘… at first we were just going to … estimate (with a protractor) but I came up with the idea of taking a picture, and actually reading properly, zooming in and actually reading it perfect[ly] …’. Here the notions of creativity—combining ideas to develop solutions [NOS 5]—and an awareness of the need to accurately record measurements—that ‘estimating’ is not sufficient, that science is rigorous [NOS 1]—are evidenced in the students’ comments. Coincidentally (and independently), an emphasis on measurement was a strong theme in both Sam’s (a scientist mentor) and Elana’s (an engineer mentor) interview responses (Forbes and Skamp 2013). Other collaborative benefits were identified. Amanda, Bill and Carla described ‘friendships’ they developed as they worked with others in different groups and learned about each other’s respective strengths and interests. A typical comment was: ‘My friend was good at presenting … and writing … I think she thought I was good at research because I just kept on searching up on the internet … and found loads of information that were good’ (Amanda). Bill indicated that his social relationships had improved as he had come to a better understanding of his own and his colleagues’ science views and strengths while Carla realized two of her friends also had an interest in science. This mutual interest could lead to science gaining a higher status amongst her peer group as suggested by Logan and Skamp (2008). These comments are evidence of CoP 2, namely, ‘members who are collaboratively engaged in activities and discussion related to the domain’. Several students commented that their own social skills had improved through group interactions, typified through comments such as: ‘when you have a partner it helps you with your social [skills]’ (Bella) and ‘[doing MyScience] has actually helped with my group skills too…’ (Becky) reflecting CoP 3, i.e. what members ‘do’ when they interact. Blake’s views of school science were transformed through working with friends. He ‘hated science’ in year 2, worked alone in year 3 as he was in a group with no friends but in year 4 worked with Ben and ‘started to change that feeling because [I realized] it's fun, because I'm learning a lot of stuff and it's good. We get to choose our own experiments. And now here in Year 5 I'm loving it’. Investigating with friends was also voiced as important for Bella and Brett. These examples show that interviewed primary students perceived that working with others during science enhanced learning (Alan), reduced workload (Adam), was more enjoyable (Bella, Blake), was more creative (Blake, Bella, Bill) and afforded the development of social skills and understanding of others’ strengths (Amanda, Bella, Brad, Becky, Bill, Carla). Other researchers have reported the beneficial effects of social interactions within primary science classrooms such as Murphy et al. (2012), who found that students enjoyed working with their friends in science, while Smith et al. (2000) found that social interactions widened year 6 students’ exposure to a ‘range of ideas … which often led them to develop more complex views’ (p. 402). Analysis of students’ interview responses appeared to indicate that school B students made relatively more comments about the benefits of working in a group (collaboratively) than those in schools A and C. Of the 16 comments cited as evidence in aspect c of assertion 1, 11 comments (69%) were from school B, three comments (19%) were from school A and two comments (13%) were from school C. These comparative numbers are notable since all students were asked the same interview questions and therefore participants’ responses will necessarily be linked to their own particular MyScience experiences. An explanation for this observation may be related to school B’s long-standing, historical relationship with a single source of mentors—company ABC—rather than the varied source of mentors for school C—pre-service and in-service secondary science teachers and secondary science students—resulting in a deeper sense of belonging to the MyScience CoP by School B mentors compared with school C mentors. This, in turn, may have influenced school B students’ sense of belonging and identity as a productive and valued member of their CoP. Another contributing factor may be that, at the time of the interviews, MyScience was embedded in school B’s curriculum as a critical aspect of the science program. This ‘two-pronged’ effect may have influenced school B students’ views related to collaboration and group work, compared with students from the other schools. School A was a first-timer school and so the development of their CoP would have been in its infancy. The variety of classroom activities going on at the same time was commented on by several students indicating their awareness of what others were doing and of the potential learning opportunities due to the relatedness of the investigations. Amelia said ‘… it’s interesting, because there’s all these activities going on at once, except they all turn out really good, and it all works out … they were all about energy sources’. Here there is a sense of satisfaction of belonging to a community of science practice: ‘there’s other people doing it in the classroom too and it’s … I don’t know how to say it, it’s just cool because, everyone’s doing some experiments’. Ben also viewed himself as part of a community of science practice: ‘If we are doing the experiment, our role is to find results. If we are not then our role is to help other people, and if they have a test to do then do their test for them’. not everybody’s doing the same thing… you learn from each other and you use it in your own experiment and you share it. … If you just do one topic (as in normal science) … you don’t really learn … you only learn that much. But if other groups do different stuff, you learn everything, ‘cause you share it (Clint). Similarly, Carla reported how she observed and learned information about other groups’ investigations because of their close proximity while Cassius described the impact of others’ work and ideas on his learning at the School Science Fair; for example, ‘we… saw what other people thought because on their poster they had the hypothesis and why they think [sic] that. So we learnt how other people think, how logical they are …’. The reference to other groups’ hypotheses, ‘and why they think [sic] that’, indicates a high level of NOS awareness and that scientific discussions (hallmarks of a community of science practice) would have been happening during the Science Fair. These comments provide evidence of students directly recognizing and appreciating that they are part of a larger collective—part of a community of science practice—where everyone is working scientifically on related topics. This is the essence of the nature of a community of practice: ‘groups of people who share a concern or a passion for something they do and learn how to do it better as they interact regularly’ (Wenger-Trayner 2013, paragraph 1). This ‘hoped for’ perception (that students and teachers see themselves as members of a community of science practice) was raised by scientist mentor Sam. His “expectation that students will develop ‘science intuition’ through participation in MyScience—through being a contributing member …” (Forbes and Skamp 2013, p. 1016) appears to have been realized. In the normal science we don’t get to choose what to do, the teachers just give it, the things to us and we just have to follow the instructions and we do it as a whole class instead of in different groups. Chad added: in normal science, you ‘just… get the information from a textbook or a teacher’, whereas in MyScience, ‘you get to do the work for yourself and see what happens, … It makes you feel like you are doing an experiment on your own’. … they give you one topic [the class theme]…(but) they don’t tell you to do one exact thing, so it makes you think of what you want to do, rather than the teacher… It’s kind of like [when] a baby gets a choice of what food they [can] eat, because then they get to pick what they like to… eat … rather than someone just giving them the same food (emphasis added). Another school B student—Blake—linked his growing affection towards science with being able to choose experiments, while Amanda noted that ‘you can learn from your mistakes’ and part of science is ‘creativity… to try and test stuff out and do mistakes…’. Several school C students also mentioned the value of making mistakes and that this enhanced their learning. ‘In some other stuff [other school subjects], mistakes … sort of distorts [sic] the whole thing. But in MyScience … it just adds to the information’ (Calum) or as Connor expressed it: ‘sometimes you find that your theory and your statements are correct… And if you don’t get it right, you learn something new’. Here, the notion of a theory underpinning his scientific data and ideas correlates with an earlier comment by Anne (‘we thought of theories why it could have been like that … contradicting the photosynthesis’). Overall, it is reasonable to infer that these comments from Amelia, Amanda, Anne, Bill, Blake, Chad, Callum and Connor come as a consequence of their participation in MyScience. The students’ own words identify their learning in science as being linked with student choice (indicated by, e.g. ‘we could choose’, ‘do whatever you want’), independence (e.g. ‘doing an experiment on your own’) and thinking creatively (‘e.g. ‘make it up yourselves’). These students prefer to choose and conduct their own choice of scientific investigation and in doing so they feel more creative [NOS 5] and that they are learning science more effectively due to the associated ownership and autonomy. This corroborates research findings by Hanrahan (1998), Logan and Skamp (2008), Olivera (2010), Osborne et al. (2003) and Tytler and Osborne (2012), who have all reported the significance of students’ autonomy for science engagement and learning. Several students, when comparing MyScience with normal school science, indicated that MyScience ‘stimulates your brain to do more… [there are] exciting experiments, so you want to do more’ (Alan); ‘…was more complicated than school work… I enjoyed it more’ and ‘learned a lot more stuff’ (Alex); required you to ‘think of things outside of the box’ (Bella) and ‘think of the instructions’ not just read them (Bill, also supported by Ben). For Brett, in a group known as the ‘NASA boys’ because their investigation was to do with rockets, MyScience meant that he ‘learned stuff that (he) thought were [sic] like impossible… Like, I thought we would never be able to make the rocket’. Despite these challenges, these students, who were normally not engaged with school work (as described by teacher Beth’s comment in authors (p. 10, 2014), experienced enjoyment and had high levels of engagement when doing MyScience. The notion of MyScience extending ‘beyond what normal classroom stuff goes into’ was independently raised by several teachers but particularly by Angela (see Forbes and Skamp 2014, especially assertion 1(a)) who observed her students using higher order thinking skills. The development of ‘higher order cognitive skills’ has been argued to be a ‘major driving force’ required for the reform of science education (Zoller and Nahum 2012, p. 209). Assertion (2): Students’ perceptions of participants’ roles, including their own, were consistent with a CoP interpretive framework and provide further insights into students’ views about the nature of science and learning and teaching science. [The student’s role is] to work with [their] partner and to also think more deeply about things before [they do their] experiment. So think, plan it thoroughly, and then do [their] experiment instead of just going straight into it and working out that there’s a lot of problems. The notion of collaboratively solving problems by working as part of a team indicates a mature view of what it means to be collaboratively engaged in activities and discussion related to the domain (Wenger-Trayner 2013) [CoP 2] while planning what to do to prevent or circumvent potential issues (‘think, plan it thoroughly…’) indicates a growing awareness of NOS 1. We made the decisions as a team. We tested the different [ideas] … if half of us said ‘We have to do this’ and the others said … [then] we tested and we looked at which one worked the best. Bob… didn't want to listen to our stuff and then we told him about this other thing that we want, and then he just got back up and [said] ‘Okay, we'll do that.’… when we mixed his [idea] with ours he went, 'That should work’. Others referred to more general characteristics of collaboration such as recognizing that their preferred working style was as a group member (Anne); realizing that MyScience was more of a team effort where students worked in groups and were responsible for their decisions; and, for Blake, appreciating that MyScience had turned (his) science (experience) ‘upside down and made it fun’ which he attributed to working with others to combine ideas to ‘make something big’ and inspiring others through sharing his findings. Taking responsibility for planning, implementing, recording and reporting their investigation. Students described how it was their responsibility ‘to be organized’ (Amelia) and ‘to have the responsibility of managing the whole experiment’ (Bella) with Anne indicating what this involved, i.e. ‘get the equipment … write the whole procedure out … carry out the experiment, record the results, measure exact soil, exact water, get the shallots, get everything basically…’. Within this context Amanda indicated that ‘[the student’s role is] to make up a topic or an experiment according to the [sic] personal interest and to test it out and to see what happens’. Several teachers (Angela, Bridget, Bettina, Chris—see Forbes and Skamp 2014) independently commented on the development of students’ ability to ‘follow their own curiosity’, to ‘work together to take their measurements’ and to ‘direct their own learning’. This correlates with Rogoff’s findings that students developed a strong sense of responsibility for their actions: ‘In communities of learners, students appear to learn how to coordinate with, support, and lead others, to become responsible and organized in their management of their own learning’ (1994 p. 225). In summary, these examples show that students were able to articulate their own and other students’ roles in MyScience which were generally concerned with the collaborative process of investigating scientifically (‘carry out the experiment’) and more specifically working with others to consider everyone’s ideas (e.g. ‘we tested and we looked at which one worked best’, ‘listen to everyone’s ideas …’, ‘made the decisions as a team’); plan (‘think more deeply…’); discuss (‘talk together…’); source equipment in a timely manner (‘worked together to bring the equipment to school…’); carefully measure controlled variables (‘exact soil, exact water…’); take responsibility (‘managing the whole experiment’); and to record results and report findings. The selected quotes (from a larger sample) provide evidence of CoP 1: Domain—acknowledged shared interest area in which members collectively learn from each other, CoP 2: Community—members who are collaboratively engaged in activities and discussion related to the domain and CoP 3: Practice—what members ‘do’ when they interact, as well as NOS 1: science is inquiry based (see Table 1). These attributes are key elements of what it means to do MyScience, and it would appear that they have arisen from implementation of the MyScience educational model. Students’ perceptions of their MyScience involvement appear to confirm that MyScience’s intended and actual outcomes have been realized—that students view themselves as contributing and valued members of the collaborative enterprise of MyScience. Involvement of real scientists as mentors. School A students appreciated that they had professional scientists as mentors: they were ‘proud to be with real scientists’ (Anne; also Alan), while Bella (School B) expressed ‘excitement’ that a ‘professional’ (engineer) was helping her. Amelia also valued that their mentors ‘belong(ed) to somewhere, and they can teach you about what they do’ demonstrating awareness of the scientists’ own community of science practice. High regard for mentors’ scientific knowledge and advice. Students described many examples of how mentors assisted them with scientific knowledge and procedural advice—often minimizing the impact of unforeseen issues on their investigations. When measuring two samples of salt (of different crystal size), Ada, after guidance from her mentor, appreciated that they needed to ‘measure…mass, not volume’, and, when investigating how objects slide over surfaces, April noted that there was ‘a big lump on it towards the outside’ but they were guided to avoid the lump as that ‘would change the experiment’. Spencer (their mentor) also helped them to understand how the lump probably occurred (due to a lengthy freezing time). Many students recognized and appreciated—as did the teachers—that their mentors had high levels of science expertise: ‘they know a lot more about science than we do… they help a lot with how to set up your experiment, and how to help it work’ (Ben), but students still felt that they retained ownership of their ideas with the mentors making suggestions for improvements: ‘we had an idea, and then the mentor made it better’ (Bill); ‘we couldn’t figure out what to do, then he just taught us, and do [sic] hints, then we figured it out’ (Brad). Connor insightfully commented how his mentor ‘really helped us, saying that we shouldn’t find the experiment first (from a list they had), we should find the question first’ (parentheses added). Connor’s mentor effectively steered the group towards the notion of having a question to investigate, rather than a recipe to follow (a common approach in primary school science classrooms) clearly involving these students in scientific discussions and ideas that were remembered and recalled during the interview. Mentors who were professional scientists were regarded as science experts whose science advice was perceived to be more accurate and believable than that of their teachers. Adam opined ‘the mentors specialised in science, so they’ll have more knowledge … teachers can only provide you with a certain amount of knowledge’ adding that mentors ‘have active information…(and) help you with things that you might not know rather than jumping onto a computer for hours’. Alex, Anne and Amanda concurred but interestingly added: ‘…but I still listen to the teacher’ (Amanda) and ‘the tips that the mentor gives you are more to do with science, and the tips that [my teacher] would give us were more about how to not get it wrong’ (Anne). These mentors seem to be regarded as science experts because they work in a scientific field (e.g. ‘specialized in science so they’ll have more knowledge’, ‘real scientists’) but the teacher still played a substantive role (also see next section). These students’ views provide triangulated data for teacher Cathy’s perceptions that students disregarded her science expertise (see Forbes and Skamp 2014, assertion 2(b)). Overall, school B students (who had engineers as mentors) and school C students (who had secondary school science teachers and science students as mentors) presented fewer comments on the comparative merits of the scientific advice provided by their mentors and teachers than school A, who had astronomers as their mentors. For schools B and C, mentors seemed to be viewed as an extra pair of hands—or ears—providing attention and advice, which would otherwise be lacking. This correlates with teachers’ views of the role of mentors as presented in Forbes and Skamp (2014), assertions 2(c) and (d). Here, border crossing has been described in two ways: for Bella, the mentors’ presence provides a link between the world of ‘what science is really about’ and school, and for Ava, the link is metaphorical (sand dents and moon dents). Furthermore, most mentors were positively motivated to provide support (‘they wanted to …’ [Bella])—an important attribute for developing a sense of belonging to a community of science practice. Students reported finding out about the nature of the work that scientists do: ‘we got to know more about careers in science’ (April); ‘we had some time to talk about his job, and he told us about how he looked at stars, and … he went to Chile once, and he got paid a lot just to look at stars’ (Amelia)—a comment also made independently by her teacher, Angela (Forbes and Skamp 2014, assertion 2, aspect (d)). These students perceived that they were exposed to aspects of science as a human endeavour through sustained face to face interactions with their mentors—as was hoped for by mentors (Forbes and Skamp 2013, assertions 1(a) and (c)). In summary, interviewed students’ valued having professional scientists as mentors. 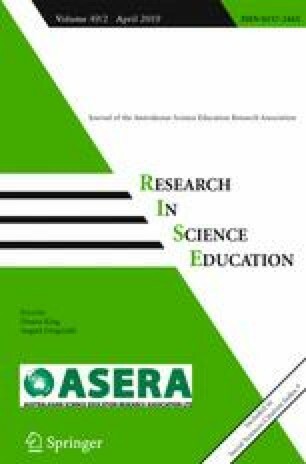 School A students (who had professional astronomers as mentors) reported receiving more credible and wide-ranging scientific expertise and guidance than that from their class teacher, and although all students valued mentors’ expertise and advice, the students retained ownership of their investigation. Both professional scientists and engineers (mentors at school B) provided a human face to the world of science while also making explicit links between ‘in school’ and ‘out of school’ science. Students recognized that mentors engaged in scientific discussion around creative ways to solve arising issues. Student perceptions indicated the positive impact of having scientists as mentors where they provided support around science inquiry processes (NOS 1), the developmental nature of science (NOS 3), creativity in science (NOS 3) and the collaborative nature of science (NOS 6). Similar conclusions have been drawn from the Scientist in Schools (SiS) project (where scientists are matched with schools) by other researchers (Howitt et al. 2009; Rennie 2012). Teacher provision of science procedural guidance and support. Students from all three schools expressed only positive views about their teachers’ role when doing MyScience. Eleven students described the supportive and facilitative actions of teachers, while indicating they were not overly directive and still helped students make their own learning decisions. Apart from making similar comments (e.g. sourcing equipment [Brad, Blake, Callum]) others added: ‘We had to figure it out. And she was like, ‘Maybe you could do this or maybe you could do that’. She gave us options and we, as a group, decided which one to do’ (Clint); our teacher put ‘reminders up’ (e.g. for equipment) (Amelia); my teacher kept encouraging us ‘… a bit like the mentors… helping us, and saying, ‘Oh this is good, you can add this’…’ (Bill). Cameron’s teacher was similar to Alex’s but he recalled how ‘she has all the posters on the boards, of how we are going to prove the hypotheses and all that [sic] solutions’—that is, evidence of reification (CoP 4) and scaffolding investigative procedures. Monitoring student behaviour (in part, due to the excitement of having mentors) was also mentioned as a teacher role (Ben; Bella). Several students, mainly from school A, compared and contrasted the roles of their teacher with their mentor. Like Bill above, April initially said her teacher helped them in a similar way to their mentor by offering ‘the same sort of guidance’ (about the lump in the ice tray—see aspect 2(b)); but she later qualified her view: ‘The mentors probably go into more of a science, more technical [explanation]—they’re sure of what they know. The teachers do too but the mentors, probably they knew more because they’ve worked in a science field’. Reasons for the mentors providing more scientific advice were also alluded to by both Alan and Anne. Alan explained that a difference between the teacher and mentors was that the teacher ‘just suggest[s] ideas that might work … whereas a mentor sort of knows …’. The attribution of ‘just’ and ‘might’ to the teacher and ‘knows’ to the mentor indicates that Alan has a higher regard for mentors’ scientific advice. Anne commented that her teacher provided ‘side tips… about how to not get it wrong’ compared with the more scientific advice from mentors. There were only two instances in all 27 interview transcripts where teachers were credited with providing scientific advice: ‘changing more than one factor’ (Adam) and she ‘knew… a fair bit about chemistry’ (Candy). Connor commented that the teacher’s role was ‘to guide us on the way if our mentor isn’t here’ indicating that, in the absence of mentors, the community of science practice was able to continue. This outcome was hoped for by participating mentors (as mentioned earlier in aspect 1(d)) and highlights the critical role of the teacher in the CoP. Becky identified her teacher as a border crosser introducing ‘the mentors to our groups’, which correlates with mentors’ (Sasha and Elana) perceptions of the role of the teacher (see Forbes and Skamp 2013, assertion 2(b)). These examples appear to indicate that students view their teacher in two main roles in MyScience: being a safety and organizational supervisor (Alex, Amelia, Brad, Blake, Connor) and being in an advisory role where the main type of information and advice offered is not considered to be as scientific as that of the mentors (April, Alan, Anne and Adam)—even though it is clear that the teacher has offered science advice in the situation described by Adam (‘changing more than one factor’). This may be because Adam (and others) perceives that their teacher lacks science expertise so their advice is not regarded as being ‘scientific’, a view which may be compounded by having mentors in the classroom. It is also possible that students may view scientific procedural advice differently (possibly with lower status) from scientific information and explanations of phenomena—an area in which the mentors are likely to have a wider breadth of background knowledge compared to their teachers. Students’ views of their teachers’ roles indicate that they are working together on the collaborative enterprise of investigating scientifically (NOS 1) with evidence of CoP 2: Community and CoP 3: Practice. Student engagement in science lessons is strongly linked to their views of their teacher (Darby 2005; Logan and Skamp 2008; Tytler and Osborne 2012). Here, students’ views of their teachers are overwhelmingly positive, which augurs well for their development of positive attitudes towards school science. The observed range of expertise and skills, by students, of their teachers and mentors, indicates the distributed nature of learning in these CoPs—a key element for successful CoPs (Buysse et al. 2003; Borg 2009; Koliba and Gajda 2009). … just goes around and … with the mentors she… looked at (how the) the groups … were going and what they were talking about. And actually she learnt a lot too… Because sometimes she’d just sort of join in the conversation [saying] ‘Oh, right. Oh, of course’. She recognized her teacher’s choice of words when she joined in the conversation as being indicative of learning something new and so was viewed as a co-learner. Although alluded to by Amanda, the comment aligns with CoP 1: Domain—acknowledged shared interest area in which members collectively learn from each other—a community of science practice is operating in the classroom and participants are learning from each other through their participation. Principal role. The role of the principal included allowing MyScience into the school and showing interest in student investigations. Six students in school A and three in school C indicated that they saw their principal mainly as a gatekeeper, deciding whether MyScience was suitable to allow into the school. Their comments suggested that principal A had little or no involvement, while Cameron noted that principal C ‘had a look at the experiments we did’ and four other school C students thought his role was to submit MyScience projects into to the Science Teachers’ Association of NSW Young Scientist Awards (http://www.stansw.asn.au/ys/). By way of contrast, four school B students thought that principal B did play a role with organizing and implementing MyScience. This quite different perspective may be due to the higher level of interest that the school B principal had for the program and that she frequently visited classrooms while students, teachers and mentors were working on their investigations—recorded through observations made by the researcher when in the field—and as shown in: ‘We showed her our experiment. She said it was really good’ (Blake), and ‘She came around, even she tried the rocket’ (Brett). Parent role. Students at schools A and especially C saw the role of parents as, in part, sourcing equipment for investigations: School C had the longest involvement in MyScience and students were expected to source materials from home. Parents were also seen as a discussion sounding board, particularly in school A, where some parents with a science background were also mentors. Students described how their parents provided assistance (at home) with their investigations—instances included ‘they… discussed it with me… taught me…asked me questions’ (Amelia); ‘My Mum…used to give me… little tips (about current investigations)’ (Anne) or suggestions for what might ‘look better, or…could work’ (e.g. a hair dryer rather than a fan) (Bill, referring to his Dad). Bella’s parents also offered advice related to investigating stain removers: ‘My parents…told me…after a while lemon juice isn’t…active anymore’, while Carmen and Connor described a similar level of assistance. Involvement was more extensive at times: for example, Ava said her parents ‘helped me research a lot … they taught me how to wire the electrodes to work in the … energy drink and they taught me a lot of stuff about salinity …’. I wasn't allowed to have photos once and then I told them [my parents] about MyScience, [that it] is really good and I could be a good scientist if I'm good. So they let me have photos and they let me put it online, because me [sic] and Marco had our last year's experiment online. Blake’s group was awarded a certificate (from the Young Scientist Awards) for their efforts and he described how “My Dad’s really proud of me because I’ve got a certificate last year for high achievement. So every time someone comes over he says, ‘Go get your certificate’”. Overall, parental advice was considered to be less important than that of the mentors and teacher and focussed on science content knowledge and understandings rather than science processes, contributing to NOS 6: science is collaborative and CoP 1: acknowledged shared interest area in which members collectively learn from each other. Parents (and sometimes the principal) were perceived by students to be part of their school’s MyScience community of practice to varying degrees and is evidence of CoP 2: Members who are collaboratively engaged in activities and discussion related to the domain. Parent and principal interest seemed to be more evident in comments from school B and C students where MyScience had been running for 3 and 4 years, respectively (while school A was in their first year), reflecting a deeper sense of awareness of the roles of participants in the CoP (because of the longer involvement) and may also relate to students perceiving a greater vested interest in their activities (for similar reasons). Another contributing influence for students’ perceptions may have been because principal A was much less involved with the program (personal communication to researcher from teachers Angela and Amy, November 2010) compared with the school B principal (see Forbes and Skamp 2014, assertion 2, aspect (e). Anfara, V., Brown, K., & Mangione, T. (2002). Qualitative analysis on stage: making the research process more public. Educational Researcher, 31(7), 28–38. doi: 10.3102/0013189X031007028. ASTA: Australian Science Teachers’ Association (2014). Primary school science teaching survey report June 2014. Retrieved from <asta.edu.au/generic/file-widget/download/id/693>. Connor, R. (2007). NSW science and technology K–6 literature review. Retrieved from http://educonv.com/docs/23948/index-4214.html. Fensham, P. (2008). Science education policy-making: eleven emerging issues: UNESCO. Retrieved December 10, 2013 from http://unesdoc.unesco.org/images/0015/001567/156700e.pdf. Logan, M., & Skamp, K. (2008). Engaging students in science across the primary secondary interface: Listening to the students’ voice. Research in Science Education, 38(4), 501–527. doi: 10.1007/s11165-007-9063-8. Murphy, C., Varley, J., & Veale, O. (2012). I’d rather they did experiments with us…. than just talking: Irish children’s views of primary school science. Research in Science Education, 42(3), 415–438. doi: 10.1007/s11165-010-9204-3. NAPLAN: National Assessment Program—Literacy and Numeracy (2013). Retrieved from http://www.nap.edu.au. Rennie, L. J. (2012). ‘A very valuable partnership’. Evaluation of the Scientists in Schools Project 2011–2012. Dickson: CSIRO Education. Retrieved from www.scientistsinschools.edu.au/downloads/SiSEvaluationReport2011-2012.pdf. Tytler, R. (2007). Re-imagining science education: engaging students in science for Australia's future. Camberwell: Australian Council for Educational Research. Retrieved from www.acer.edu.au/documents/AER51_ReimaginingSciEdu.pdf.